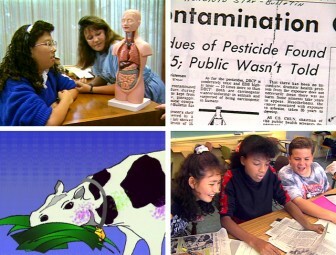 Intermediate school students explore various aspects of the 1982 incident when unlawful levels of the pesticide heptachlor were found in Hawai‘i commercial milk supplies. The students research the subject of the pesticide contamination from environmental, medical, political, legal, and public health points of view, interviewing two doctors, a chemist, an attorney, government officials, an entomologist, a public health activist, and an organic farmer, mentored by the director of the Hawai‘i Heptachlor Research and Education Foundation. This documentary was produced in 1991 and updated in 2005 after long-term medical studies on the impact of the contamination were released. "Heptachlor in Hawai‘i impressed me greatly. The students in the video are excited and motivated about what they are learning. This is the way education should be." "An excellent step-by-step portrayal of stimulating, real-life research in a public school."